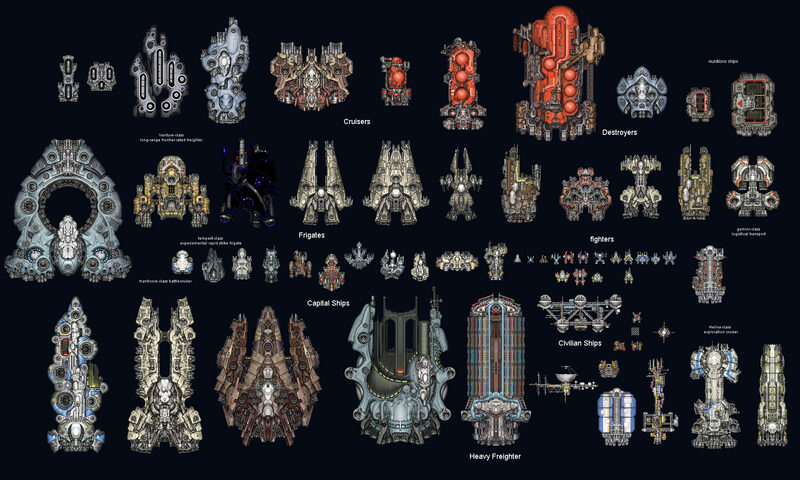 David sent this to me a little while back, and I thought it was very cool to see all of the ships together like that. Most of these are in the game, but some aren’t just yet and a few may or may not make it. A lot of the ones not currently in the game hint at features under consideration. Let the rampant speculation begin! The title of this post is deliberately misleading. It’s mostly about crew management and me, you see. Specifically, about how the current system came about – and what it is. But now that I’ve tricked you into reading, I hope you’ll stay with it – you won’t get those couple of seconds back anyway, so might as well keep going! There are three main reasons to have crew in the game: to increase immersion, to add another avenue for advancement, and to introduce interesting resource management mechanics. In other words, having a tangible crew is neat, watching them go from raw recruits to seasoned veterans is rewarding, and having a say in how the crew is used to get the most out of them is engaging. The crew is far from being the main mode of advancement, though – the player also has their own skills, officers, ships, and weapons to upgrade – so it’d be a mistake to look at it solely from the player advancement angle. However, figuring out just how to model the crew of your ships has been a difficult process. There are two components to the mechanics: advancement and assignment. Advancement is how the crew progresses through experience ranks. Is it linear, or can crewmen specialize in gunnery, piloting, and such? Assignment is just how the player matches up the crew to the ships they run – what amount of control they have over it, and exactly how it works. Those components depend on each other a great deal. Suppose the player just has one ship – we don’t need to worry about assignment at all, then. Free from this concern, we could come up with an involved scheme for crew advancement – with individual crewmen progressing through the ranks all the way from raw recruit to master gunner or somesuch. On the other hand, suppose the player has a large fleet. Do we really want them to worry about making sure the ISS Unlikely to Survive has the right number of gunners? If they’re losing a ship or two every battle – and with large fleets and battles, that’s quite likely – having to re-crew new ships afterward would quickly become a chore. What we need is to strike a balance – enough detail for immersion and sense of advancement, but not so much that the mechanics become a bother for large fleets. The mechanics should let the player make meaningful choices with a minimum of fuss – not make them perform rote actions over and over. The crux of the problem for me was the need to assign crew to specific ships. I kept turning that over in my mind, and just couldn’t get around the awkwardness of having to manually do it. You’d have to handle it for new ships, for re-crewing ships after losses, and for switching crews around for key battles – to name just a few situations. It’d be a royal pain. We’ve got a planned set of features for next release, but every so often I like to take a couple of days and work on some lower-priority features that just wouldn’t get any attention otherwise. Of course, the feature has to be cool enough to justify the time spent! It is my pleasure to now introduce one such feature – damageable ship modules. Now when you shoot a ship, you can gradually disable its weapons and engines – more on the details in a bit. For those with a shorter attention span – or simply less time – here’s a video showing the end result in action. I’d suggest reading on about how it works to help it all make sense, though. By the way, if you haven’t kept up with the latest changes in the development build, this thread on our forum has the full patch notes for everything that’s been done since the last release. Read on for the reasoning behind this mechanic and the details of how it works. I’m happy to announce that we’re going to be the first interview in QubeTubers IndieWeekend! We’ll be streaming the latest, in-development build of Starfarer, so this is your first chance to see some of the new features in action – in particular, the fleet command mechanics & interface. The event starts at 8pm today, Friday August 5th, and our interview is from 9-10pm EST. We’ll also be giving away a couple of Starfarer activation codes to viewers that ask particularly thought-provoking questions about the game, so if you’d like shot at a free copy of the game, do tune in!